Health & safety is our primary concern for any project and we understand this is of paramount importance to our clients. Soifix prides itself on having an exemplary health & safety record with no prosecutions or enforcement actions in over 14 years of trading. Our NEBOSH NGC Accredited Health & Safety Director, Richard Mabe, is responsible for ensuring that Soilfix leads best practices and stays in compliance with the latest legislation. Two additional NEBOSH accredited staff support Richard. Soilfix also employs external health & safety consultants to provide advice and external auditing to ensure Soilfix stays at the leading edge of safe working practices. In addition to our ISO OHSAS 18001:2007 accreditation, Soilfix is an Accredited Member of SMAS Worksafe, a member of Construction Line and an approved SAFE Contractor. All of our site employees are CSCS accredited and first aid trained, and all Site Supervisors / Managers are SMSTS, SSSTS or ISOSH Managing Safely accredited. Soilfix projects regularly involve working under the CDM Regulations, and we often take on the role of principal contractor. We are also experienced in working to the stringent procedures required by our many clients including those from the fuel retail and petrochemical sector. Soilfix employees participate in the management of health and safety by reporting incidents and near misses, maintaining plant and equipment, attending regular tool box talks, and undergoing targeted training both internal and external. As much of our work is conducted on contaminated land, we are trained and highly experienced in the handling, storage and transport of toxic substances. We are continually evolving our H&S procedures and documentation to ensure effective communication of safe working practices to our site staff and other suppliers. We actively encourage worker engagement on-site to take on board suggestions for more efficient (and safe) working practices to evolve our H&S management system. 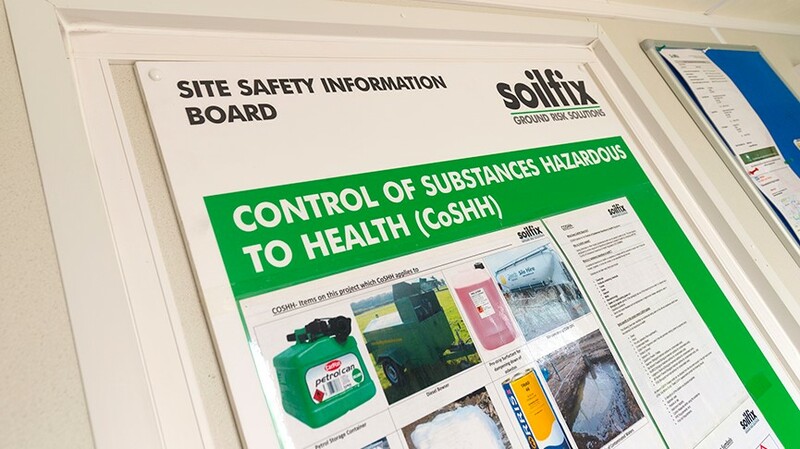 Health and safety is reviewed at Soilfix’s monthly management meetings and, where appropriate, systems are improved and the information disseminated to all employees, suppliers and sub-contractors. We undertake regular external audits of both our procedures and training requirements to ensure we are positioned to exceed our clients’ expectations. Soilfix site staff are regularly awarded ‘Green Cards’ or similar initiatives by our clients through achieving zero lost time accidents during contracts and exceeding expectations on Health & Safety.